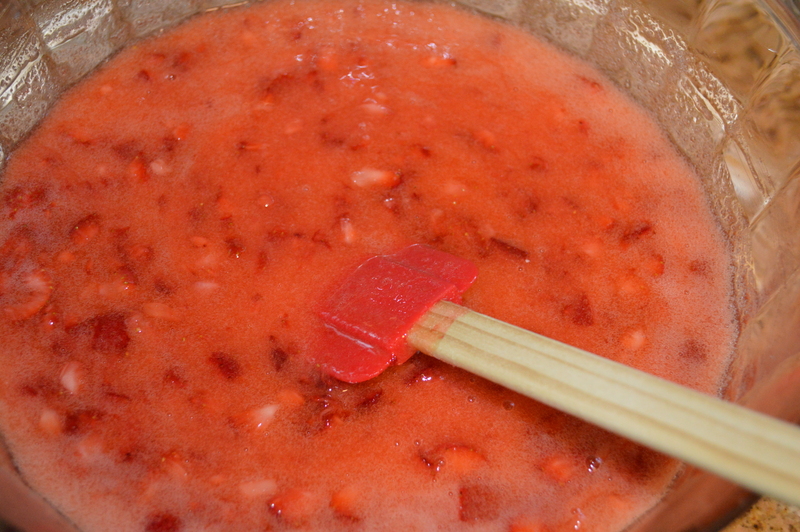 Have you ever wondered how to make strawberry freezer jam? Well, I have taught so many people how to make freezer jam that I’ve lost count now, and I can teach you too! 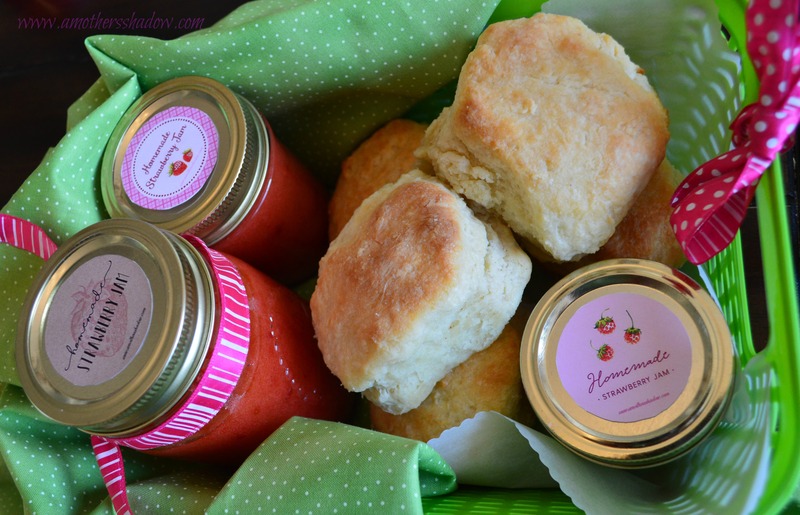 This type of homemade Freezer Strawberry Jam is so delicious because it uses fresh fruit; making the taste absolutely phenomenal. It’s best to make this recipe when the strawberries are peak freshness, in season and inexpensive and economical. I like to store the prepared jam in small individual freezer bags so I have it available anytime of the year. 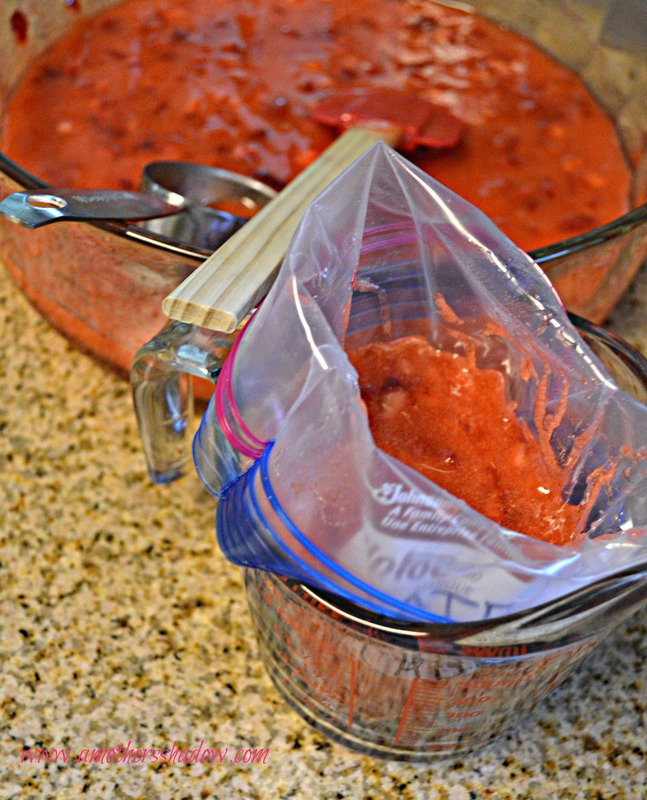 The containers and baggies I double protect by placing them in a larger bag, before storing in the freezer. 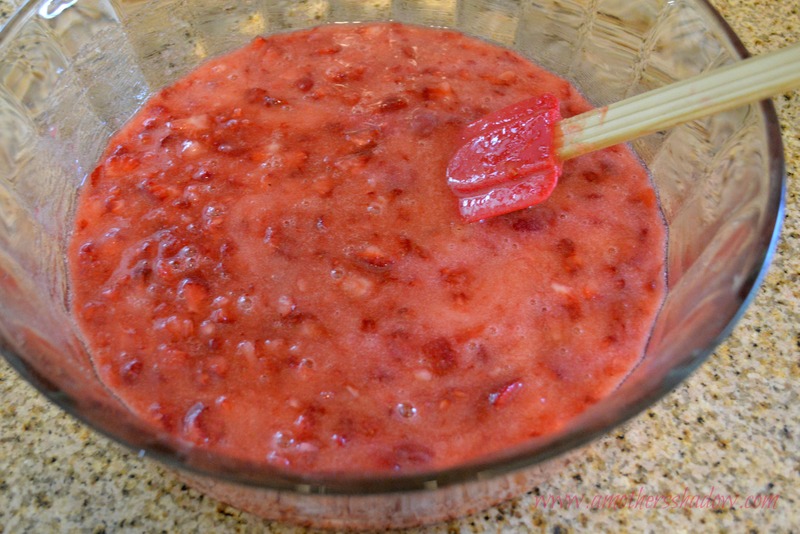 Another idea, is to make up batches of the easy no cook strawberry freezer jam, pour it into small containers with tight fitting lids, and freeze it (as directed on the package) to give as gifts for Mother’s Day, Father’s Day, birthdays — or just because. Click HERE for the free labels I had made just for you! 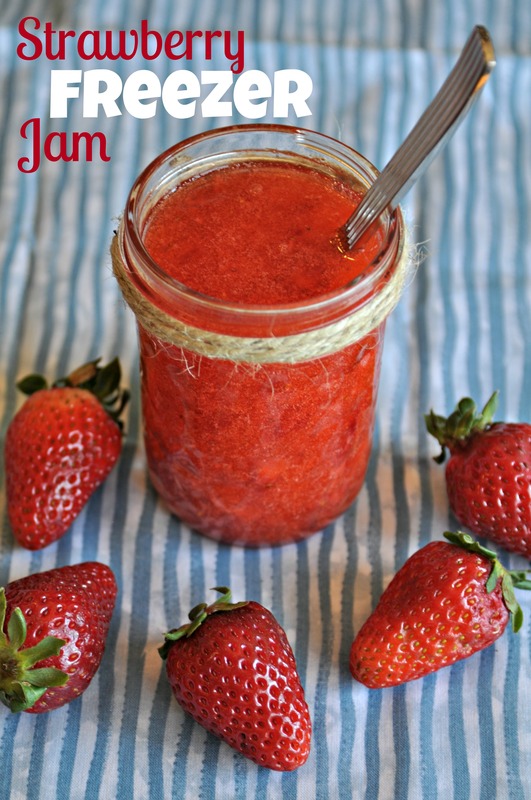 This delicious Easy Strawberry Freezer Jam would be so yummy on my moist homemade CornBread or for a special treat on the No Sour Dough Start Artisan Bread , now that would be amazing! Let’s make jam!!! Containers with tight fitting lids (disposable or even glass jam jars would make darling gifts) that hold 1/2 cup to 2 cups / zip lock freezer baggies. Wash and dry the containers you have chosen; not necessary with new freezer baggies. 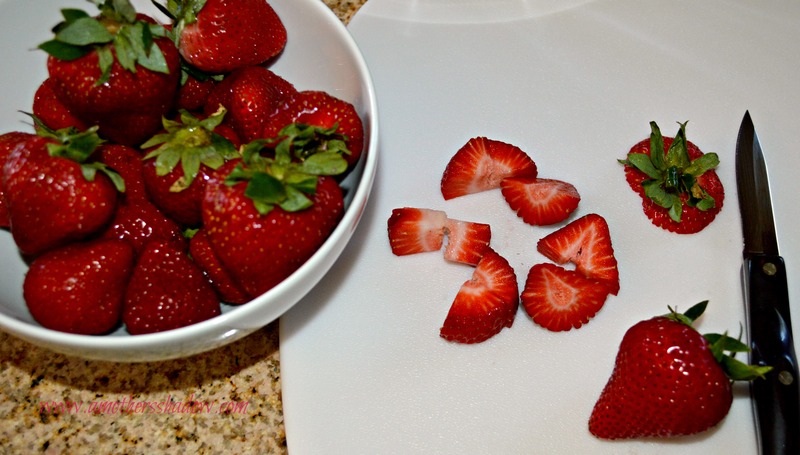 Cut the strawberries into large chunks, if you like some texture to your jam. If you like a smooth jam, simply chop the berries really small. 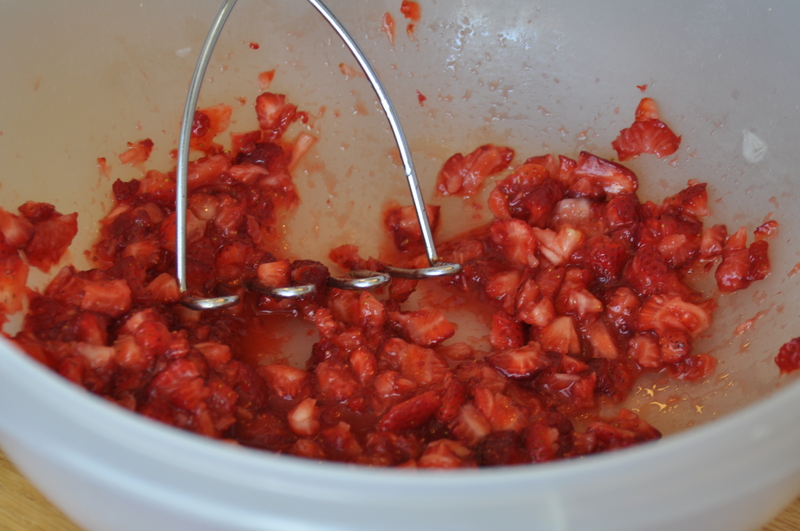 Now, with the chunked berries, mash them a little with a potato mashers IF you like little bits of fruit in your jam. In a separate bowl measure the exact amount of prepared fruit as called for in the recipe – don’t be tempted to add or decrease. In another bowl measure the exact amount of sugar no less or no more – the exact amount called for. 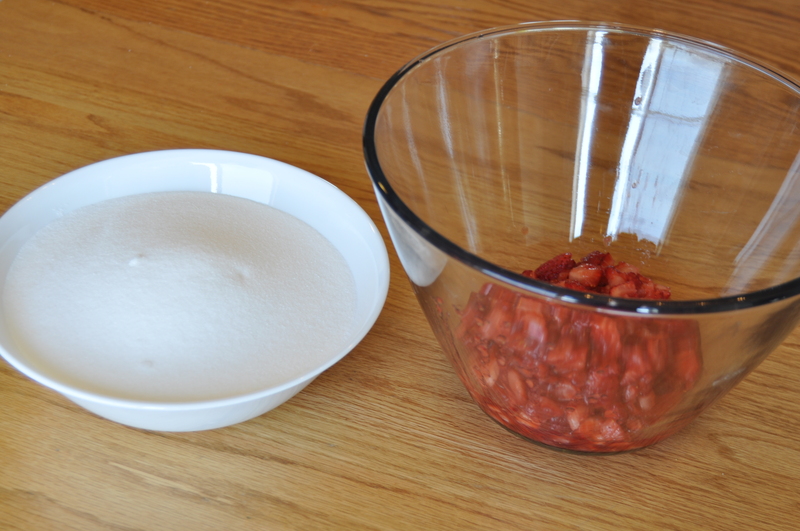 Stir the sugar into the prepared fruit, mix it well and let it stand for 10 minutes stirring frequently – no cheating here! Pectin, which is what causes the jam to set up, is in the box along with the instructions. Take out the packet and pour it into a small saucepan adding in the required amount of water (which you will find on the instruction sheet in the box). 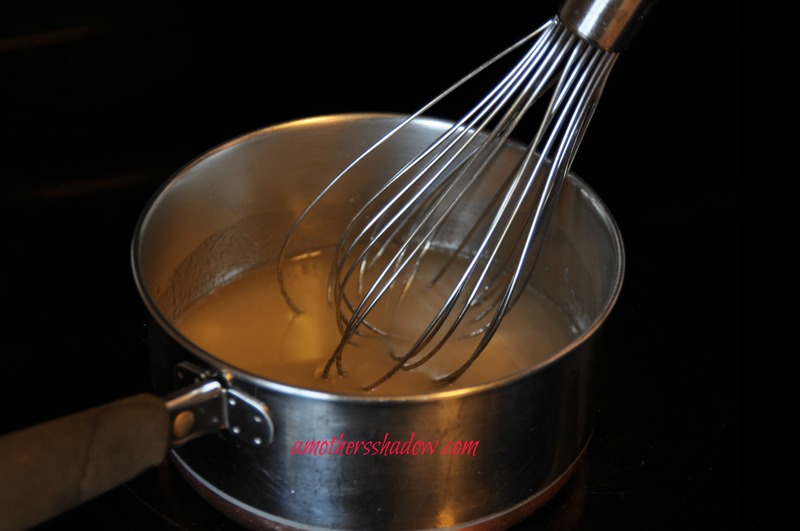 The mixture will start out lumpy, but keep stirring until it comes to a boil on high heat. Stir CONSTANTLY!!! It burns easily and you don’t want to waste it. Boil, still stirring for 1 (ONE) full minute. 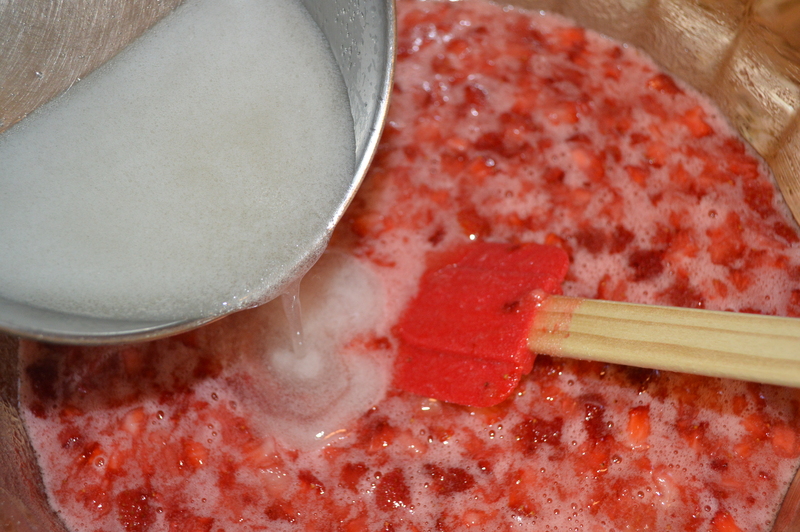 Remove the pan from the heat and stir the pectin mixture into the fruit. 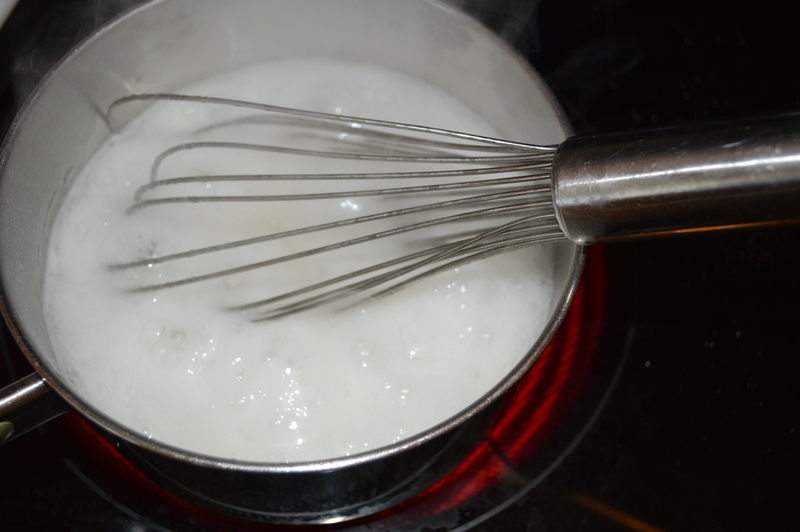 Stir constantly until the sugar is COMPLETELY DISSOLVED and no longer grainy, about 5 minutes. This is very important or your jam will ‘sugar’ and be grainy, very distasteful to eat. Fill whatever containers you desire. Disposable, baggies, glass… Make sure to date and label them. 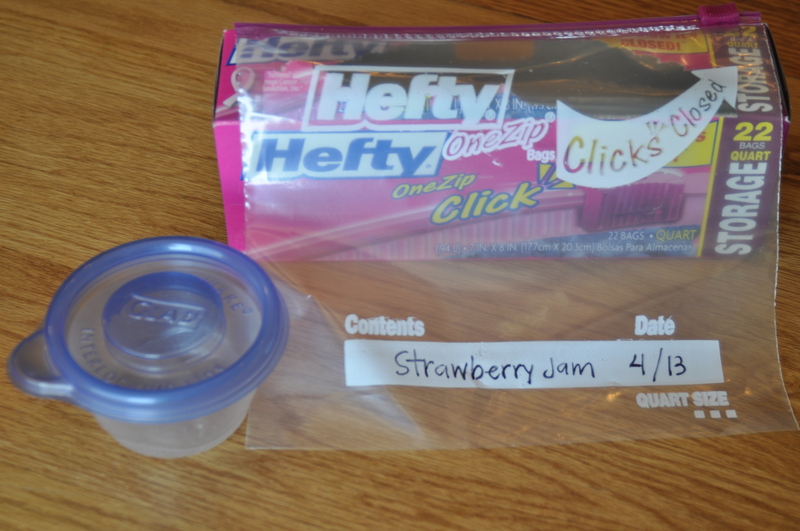 IMPORTANT STEP: You must let the jam, in the baggies or containers sit at room temperature for 24 (count ’em 24) hours. This allows time for the sugar to completely dissolve and the pectin to do its work. AFTER 24 hours, the jam is ready to eat, put in the freezer and take to someone who could use a little happiness. Note: When the jam is in the freezer, it never completely sets up hard because of the sugar content, so don’t worry when it’s not solid. When taking the jam out of the freezer, allow it to thaw in the refrigerator. Refrigerated jam will last up to 3 weeks and in the freezer for 1 year. This jam is amazing in homemade shakes, on waffles or pancakes (click HERE for my recipe) on toast, you name it! Be creative when thinking about what to put your jam in. 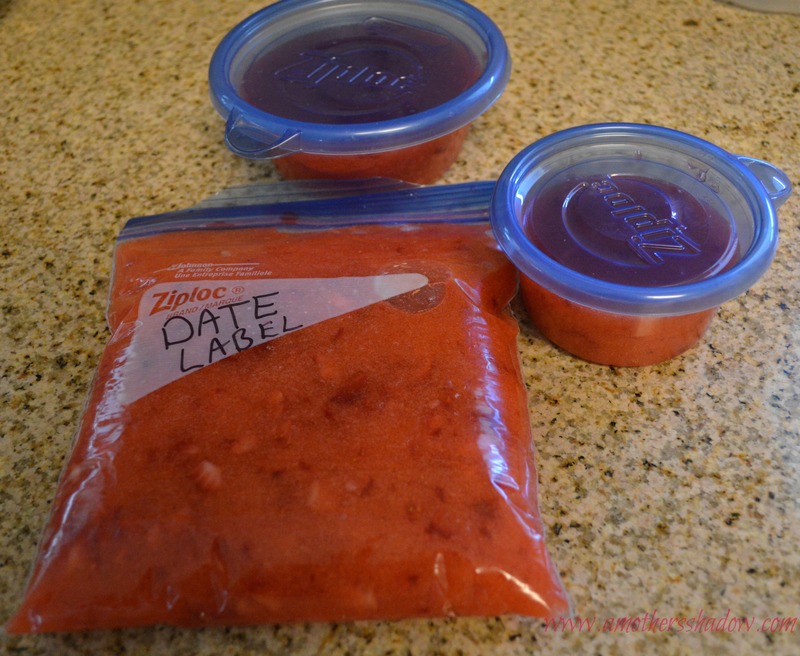 Jars from the Dollar Store make adorable containers for this Homemade Freezer Strawberry Jam. 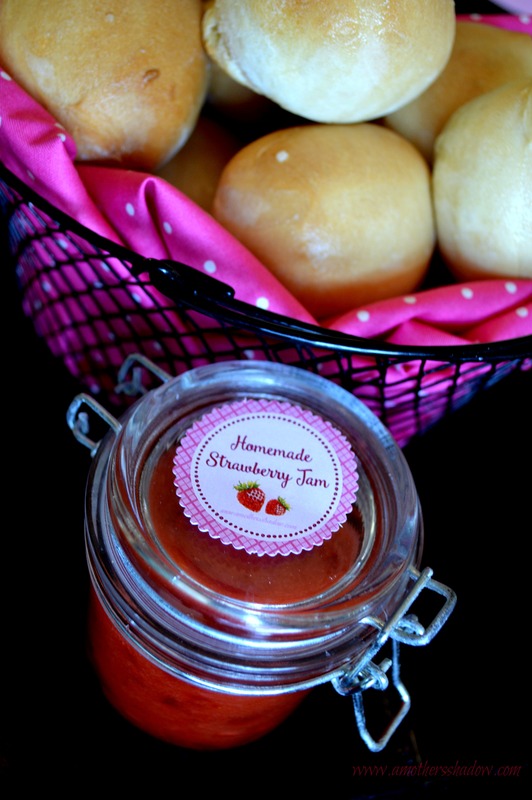 Baked frozen roll dough, a filled cute jar with an attached label you can get HERE would make anyone feel extra to receive your delicious homemade Strawberry Freezer Jam. 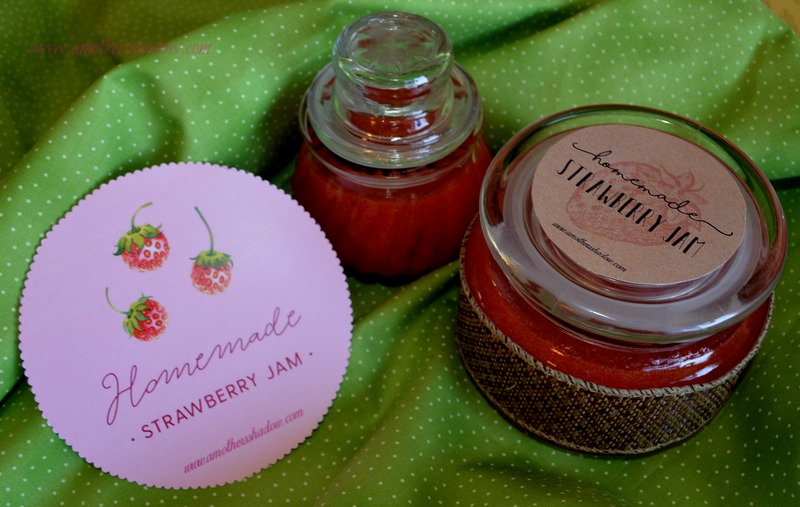 Spread the sweetness and make someone’s day better as you gift a bit of your yummy, easy to make homemade Freezer Strawberry Jam.